This morning or this evening wherever you were in the world at the time, Australia held their first ever National Final to find the act who will represent them at their fifth appearance at the Eurovision Song Contest. Ten acts gave their all, competing in Eurovision – Australia Decides, where for the first time a jury and the public picked the song to represent Australia at the Eurovision Song Contest. In the past four years, their representative was selected internally. 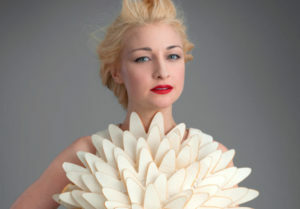 In the end Kate-Miller Heidke was chosen to sing the song Zero Gravity. The show was hosted by Myf Warhusrt and Joel Creasey. Myf is a 44 year old, Melbourne based radio announcer and television host, best known for presenting Spicks and Specks. Myf wore a red dress. Joel is a 28 year old and is also Melbourne based. He is a well known comedian and television presenter. A sparkly silver jacket was his outfit of choice. Despite both hailing from Victoria, neither could resist the offer of presenting Eurovision – Australia Decides from the Gold Coast Convention and Exhibition Centre in Broadbeach, Queensland. They were both terrific. Casey Donovan opened the show with a rendition of Guy Sebastian’s debut entry Tonight Again getting the crowd into an immediate frenzy. After the acts were introduced we got a brief video of Australia’s history in the contest, where it was revealed Australia first broadcast the show in 1983. Before each song, the performers gave us a brief little history-bio about themselves and their song. During the time that the public could vote, Dami Im treated us to a piano version of her second place Eurovision song, Sound Of Silence. This version would probably not have come second. Hans The Berlin Boy Wonder and his accordion gave us a rendition of some Eurovision past favourites from Volare to My Number One, Shady Lady to Euphoria and Toy. Dami returned one more time to perform her new song Dreamer. Opening the show, Ella is a relatively well-known rocker chick in Australia, still trying to get her first big chart hit. There is a bit of Pat Benatar influence here. Uptempo and exactly as advertised on the box. If rockier is how Australia wants to go , Ella has it in the bag. In her black lacy pantsuit, Ella was accompanied by a rocking guitar chick and two male musicians in the background. This was a fair opening song for the show, but perhaps not quite the song to represent Australia. This electronic number from duo, vocalist Zaachariaha Fielding and keyboard player Michael Ross are the only act to have a song not entirely in English. Part of the song was sung in Pitjantjatjara – a language Eurovision needs right now. The song is dedicated to all the millenniums in the world. The aboriginal rhythms blended perfectly with the dance beat throughout the song, and this should be in with a good chance of winning. Tenor singer, Mark won Australia’s got talent in 2009 and has released an album every year since then. Busy Mark took time of to present this polished and powerful performance, but the song is more suited for the Italian opera halls than Tel Aviv’s convention centre at Eurovision time. Still opera has done well at times so you never know. Already the Australian show is to be commended for the many different types of songs they have in the show. It’s The Voice – Australia where young Aydan got his start. This is closest to Don’t Come Easy, Australia’s 2017 entry. The song is a bit slower and as Aydan described it was a very personal song to him. If subtle and under stated is your thing, this is the one for you. Aydan is the fourth act in a row all dressed in black, which you would have thought wasn’t the best for the Australian weather. A no frills performance which just might not quite hit the mark, but enjoyable enough nonetheless. Australian idol and drag queen, Courtney performed her song on an empty stage with no frills whatsoever. Just kidding, a light shone from an opening in the stage and Courtney appeared in a shocking red, was it PVC red dress and boots right away up above the knee. She was accompanied by five all in red dancers, but it may have helped if she’d added a couple of backing singers. There is no doubt this is a very Eurovision type song and in her interview before the song it’s clear Courtney is a wonderful person and would be great in Eurovision world. See alsoThe UK has decided: Michael Rice for Eurovision 2019! Leea is a little less known in Australia than her contemporaries, but easily held her own. This is her debut on a big televised show but you wouldn’t have thought so. Back to black clothing again this starts a little like Chains by Tina Arena. Leea stood and just sang the song and coincidentally Chains were mentioned in the lyrics. The song built into a bit of a march tempo as it headed towards the end. Right at home, this Brisbane sibling trio are probably the best known act outside of Australia, oh really says Courtney Act. Their single Geronimo was a major hit in several European countries in 2014, and of course was a chart topper in their homeland. This entry is very similar to Geronimo, easily liked yet equally irritating with repeated listens. Surprisingly this performance was a bit flat, but certainly added a touch of colour to the stage. One of the ladies had blue hair while her sister played guitar in a shimmery silver dress. Another voice alumni, Alfie has a terrific clear and powerful voice. The song is a big ballad which builds just at the right time to keep you attentive. Sure it’s another self reflection number but there is no reason to not like this. Alfie too has chosen to wear black. A bongo drum helped build the song. Could be a surprise winner. Kate and her music is described as quirky and alternative. She scored a big hit in 2009 with The Last Day on Earth. This entry is a mix of the bizarre and alternative but screamed Eurovision. It has to be watched to fully appreciate the performance. Many types of music and tune were involved, from floaty folk to electronic and a bit of opera. All in under three minutes. Kate was dressed as a tribute to the Statue of Liberty, all in silver and the old rising dress trick She was joined by a lady floating behind her. Can it fail? Sweden can’t help being involved in every Eurovision contest, and here’s Tania who now resides in Stockholm. Tania ia a pretty successful singer songwriter. The verse is a little slow but as with all good songwriters she comes out with a killer chorus. Her costume was purple and she was joined by a male and female dancer using staging she obviously learned watching Melodifestivalen. A little bit of a downer following the extravagance from Kate, but good enough on it’s own. Well done Australia for an excellent show. Australia made their first appearance in the Eurovision Song Contest in Vienna, in 2015 when Guy Sebastian came fifth with Tonight Again. Dami Im inmpressed and won the jury vote in Stockholm in 2016 with Sound Of Silence, but ended up in second place to Jamala with 1944 from Ukraine. Isaiah took Don’t Come Easy to Ukraine in 2017 and finished in ninth place. So far, so good but last year Jessica Mauboy felt the wrath of the public vote. Coming last with them, with her song We’ve Got Love, Australia found themselves slip to 20th place. Will this years act return Australia to a good position? ← The UK has decided: Michael Rice for Eurovision 2019!